Back in 2003, I thought it was amazing when Seth Cohen from The O.C. first taught the world about the magic of Chrismukkah. As a young, Jewish law student hoping to marry my wonderful Catholic boyfriend, I pictured decorating Christmas trees with dreidel ornaments while eating latkes and drinking eggnog. But now that I have married that same Catholic boyfriend and given birth to our two wonderful multifaith children, I completely reject Chrismukkah and all of its trappings. Sorry Seth, I feel like I have failed you! Despite my commitment to Judaism, I love Christmas. I was raised decorating a Christmas tree at my mother’s best friend’s home and I was absolutely ecstatic on the day when my husband and I bought our first tree. One year back in college when my now-husband complained that with the stress of finals it didn’t even feel like Christmas, I ran to Meijer’s, bought a cart-full of lights and other decorations, broke into his apartment and channeled my inner Clark Griswold. Now, each year I make a pilgrimage to an old Polish grocery store to buy ingredients for czarnina (duck blood soup), dill pickle soup and homemade pierogies to give my family the ideal Polish Christmas dinner. Growing up in a fairly secular household, Hanukkah felt like the pinnacle of the Jewish year. A holiday with fried foods, fire, chocolate and a spinning top—it simply does not get better for a Jewish child. The presents were just icing on the cake. Santa Claus may never have visited my house growing up, but I never felt deprived by the lack of Christmas. I simply loved every one of the eight nights of the holiday that we celebrated as a family. So, if I love Hanukkah and I love Christmas, how did I come to reject Chrismukkah? Simply because each holiday stands on its own with their beautiful traditions and observances. Just because of the coincidence that they fall close together on the calendar – and even occasionally overlap—does not seem like a good reason to conflate them. For a household that celebrates both Christian and Jewish holidays as our does, it is silly to pretend that these two holidays share equal importance. Hanukkah is a great deal of fun but it is really a minor holiday. When Jews are celebrating a major holiday we either don’t work or don’t eat but on Hanukkah we get to work and get to eat. It is a fun celebration about a military victory that happened centuries ago which did not permanently change the course of our people. Christmas for Christians is the celebration of the birth of Jesus Christ—the very reason for their whole religion. Next, there is the issue of presents. Seth Cohen taught us all that Chrismukkah was “eight days of presents, followed by one day of many presents,” While I appreciated Seth’s enthusiasm and acknowledge that this holiday was invented by a fictional television character when he was six years old, the focus on presents in the celebration of both holidays seems to misplace the emphasis on what we are actually celebrating. For Jews, Hanukkah is the celebration of a miracle, a military victory and religious freedom. 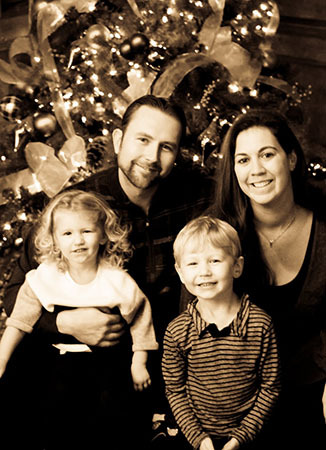 For Christians, Christmas is a celebration of the birth of their savior. Neither holiday is actually about buying our children an overwhelming amount of plastic toys from big chain stores. Now, I cannot claim to deprive my children of gifts. They get 12 gifts over the course of both holidays. In the tradition of Hanukkah, they get eight days of books and t-shirts and pajamas with an occasional pair of socks thrown in. For Christmas, they will get three toys from their parents. Why three? Because the New Testament states that Jesus was given three gifts upon his birth, so it seems unnecessary that my children would get more than that. Assuming that my children have not found themselves on Santa’s naughty list, I imagine the big man will choose to drop by with a single gift but I have been very clear with him that no more than one gift per child will fit down the chimney. While our family loves both Christmas and Hanukkah, there will be no dreidels on our Christmas trees or Jewish stars made of our Christmas lights. There will not be candy canes served with latkes or Santa Claus menorahs. There will be two separate holidays, with two separate sets of wrapping paper and two separate sets of traditions. 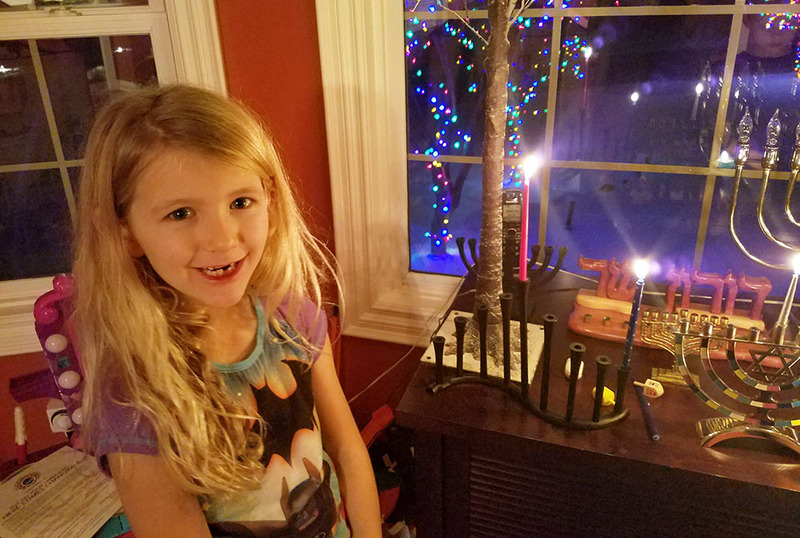 Even in years when the holidays overlap, we will take a few minutes, saying our prayers while lighting the Hanukkah menorah before moving on to our family Christmas traditions. Despite the pressure to smush everything together into one large wintery mega holiday, we will try our best to teach them about the meaning and importance of each holiday. In my personal favorite imagery of Hanukkah, in describing the way that Jews light the Hanukkah menorah by lighting a single candle (known as the shamash) and then using that candle to light the other candles, Rabbi David Wolpe famously explained, “The Shamash is the candle that lights the others. Be the Shamash.” Through this imagery, Hanukkah becomes an admonition to bring positive light into the world. In one of the only true similarities between these two holidays, Christians are taught that Jesus was put on Earth to bring light to the world. So perhaps the true meaning of Chrismukkah is that each of us—regardless of religion or faith or tradition or upbringing—are meant to bring light into world. So this season, whether you celebrate Christmas, Hanukkah, Chrismukkah, or nothing at all, may you bring light into the world and into the lives of those around you. This post was reprinted with permission. Posted in Unscripted | Tagged catholic, Chrismukkah, christmas, Christmas tree, dreidel, eggnog, hanukkah, holidays, Huffington Post, Jewish, latkes, light, lighting candles, menorah, ornaments, presents, Rabbi David Wolpe, Seth Cohen, Shamash, The O.C.